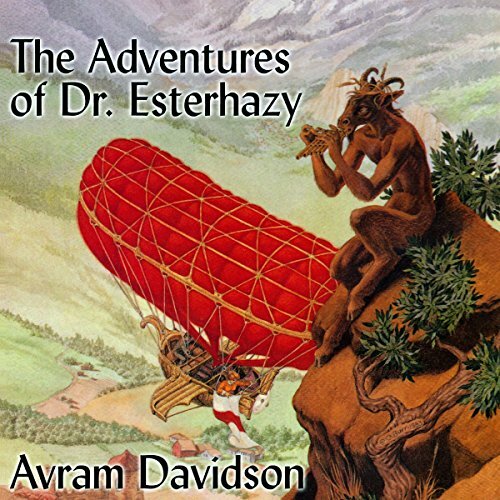 A few words from Neil on The Adventures of Doctor Eszterhazy: "We picked the Eszterhazy stories for Neil Gaiman Presents because I wanted to convey the joy and delight of Avram Davidson's short stories. This is the first place all of the Eszterhazy stories have been collected together, including "The Odd, Old Bird", which was not part of the print edition of The Adventures of Doctor Eszterhazy, but could be found instead in the collection The Other Nineteenth Century. If you love fantasy, if you love alternate worlds, or if you just love good stories well-told, that's who Avram Davidson is - someone who knows a great deal more than you do and is damned if both of you aren't going to have a great time in Scythia-Pannonia-Transbalkania." Avram Davidson (April 23, 1923 - May 8, 1993) was an American Jewish writer of fantasy fiction, science fiction, and crime fiction, as well as the author of many stories that do not fit into a genre niche. He won a Hugo Award and three World Fantasy Awards in the science fiction and fantasy genre, a World Fantasy Life Achievement award, and a Queen's Award and an Edgar Award in the mystery genre. The Adventures of Dr. Eszterhazy (1991?) assembles all fourteen of the Dr. Eszterhazy stories by Avram Davidson, mostly from the 1970s and 80s, and puts them in internal chronological order, beginning with his hero's origin and working up through his learned degrees and outre experiences to a bleak hint that his troublesome and beloved Scythia-Pannonia-Transbalkania Triune Empire will disappear. SPT is a union of fractious ethnic groups with different languages, religions, and traditions, all ready to disintegrate at the slightest excuse. The Eastern European SPT Empire exists in a fictional, alternate world around 1900. The stories refer to many of our world's countries and political, literary, and scientific figures and developments, often with tweaks to signal that we are not in Kansas. In Dr. E.'s world, the supernatural (witches, wizards, magic, divine winds, etc.) is real, yet technology is advancing (almost) as in our world, so the stories feel a bit like proto-steampunk. Like Sherlock Holmes, Dr. Eszterhazy lives at an address in his capital city (33 Turkling Street in Bella), is an eccentric man of genius, learning, and discretion, reads newspapers avidly, and pursues bizarre crimes and situations that stump the authorities. Unlike Holmes, Dr. E. is learning everything he can about everything (from jurisprudence, medicine, and science to philosophy, literature, and magic) for the mere sake of knowledge, often witnesses rather than solves mysteries, and is willing to accept supernatural explanations or no explanations. The stories are comedies of politics, religion, culture, tradition, science, and magic, and often feature internal or external threats to the Triune Empire. The stories are discursive, reflecting Dr. E.'s motto, "often pause and turn aside." And they are funny, from comical situations, as when an Australian travel writer unwittingly eats some special "poultry," to witty dialogue, as when a bitter Baron asks the be-moccasined Yankee frontier poet Washington Parthenopias "Pard" Powell if he was ever really in Honduras, and the bard replies, "Was Dante ever in hell?" The humor can be silly, as when a put-upon minister trying to get Dr. E. (of the myriad doctorates) to do him a favor stammers, "Dr. Eszterhazy, Dr. Dr. Eszterhazy, Dr. Dr. Dr. Eszterhazy, Dr. Dr. Dr. Dr. Eszterhazy--" until he's finally stopped. Often the descriptions are humorous, as when visiting a barbaric backwoods prince, Dr. E. "pass[es] through the great hall adorned with rude and massive furniture on or in which giants might have sat cross-legged and smaller men have camped." And the narrator is wont to interrupt himself: "a man, no longer at all young, with a weather beaten and worn--worn? ERODED face." The constant humor begins to numb, but even towards the end of the collection Davidson often made me smile. And some denouements are moving. "Cornet Eszterhazy" involves the incognito King Magnus of dual rival Scandinavian countries, the king's Skraeling shaman-bodyguard, the eccentric SPT Emperor Ignats Louis, some bitter revolutionists, some feisty American wild west show entrepreneurs, a semi-retired local brigand, a trio of Christian priestess-witches, and a noble errand boy called Cornet Esterhazy, who, as a result of the adventure, will leave the court to court knowledge. In "The Autogondola Invention" Esterhazy, now a Doctor of Philosophy, hosts a seance attended by a dodgy Finnish medium, a fake riverboat captain, a shabby inventor, an irritable Baron, and the poet "Pard" Powell, after which they all end up somehow flying off to try to save the Triune Empire. In "The Duke Pasquale's Ring," a dread wizard has targeted a possible Ring of Power belonging to the King and Queen of the Single Sicily living in impoverished exile in Bella. Can Dr. E. use science to thwart the magical villain? In "Writ in Water, or the Gingerbread Men" Dr. E. learns the history of gingerbread men and watches the collision between an immemorial sacred grove and a new "clean" engine. Dr. E must try to use mountain magic in "The King Across the Mountains" to stop the feckless heir of the heir of the Emperor from eloping with a married gypsy dancer. In "Polly Charms, the Sleeping Woman" Dr. E. goes with Commissioner of Police Lobatz to watch a side show act featuring a girl who has been asleep for thirty years. Is her manager an infamous mesmerist from England? Is she another M. Valdemar? In "The Crown Jewels of Jerusalem, or The Tell-Tale Head," the titular jewels are missing, a disaster for the SPT Triune Empire, so Dr. E. is soon analyzing his intensely detailed phrenological study of the skull of a likely suspect. In "The Old Woman Who Lived with a Bear" Dr. E. hears of a backcountry witch living with an infidel she charmed into the shape of a bear. Or is he only an ex-hussar with a bear-fur shako and a brain-damaging war injury? "The Church of St. Satan and Pan Demons" brings together a secret Christian Diabolism cult and an eager American railroad company. In "Milord Sir Smiht, the English Wizard" the snobbish Sir Smiht (who misspells his name, Smith, to help the many Europeans who cannot pronounce it right) has been manipulating the Odyllic Forces for a fee. When Dr. E. investigates a rumored undine in a river by some superstitious peasants in "The Case of the Mother-in-Law of Pearl," he discovers some sad truths. In "The Ceaseless Stone" Dr. E. and Commissioner Lobatz are on the case of a mysterious guy selling rings made of pure gold for cheap prices. Is it dragon's gold, or has another ex-chemistry teacher broken bad? "The King's Shadow Has No Limits" gives Dr. E. an unsettling day in which he possibly sees the SPT Emperor impossibly playing the geriatric pauper here and there. "An Odd Old Bird" is a tall-tale joke story in which Dr. E. and the Imperial Geologist hope to get the fossil of the missing link between dinosaurs and birds, while an ignorant hunting prince is more interested in a pointillist painting. The collection closes with "The Inchoation of Eszterhazy," an afterword in which Davidson recounts how he came up with Dr. E. and SPT. Robert Blumenthal relishes reading the discursive and witty text with all its exotic proper names, big vocabulary words, and varied accents. A highlight is when a fiery Bishop fondly recalls "that Godly man Duke Vlad the Impaler, rrrrrr." That said, to make the stories with their strange names and digressions easier to follow, I had to listen to the first ten minutes of each story twice. Patient people interested in clever and digressive alternate history stories in which magic and science collide should enjoy this book. To describe the "plots" would be impossible. But Neil Gaiman in the preface refers to the interview process for a reader, and I can only rave at the excellent choice. He can Read! He can pronounce words correctly! Even foreign words! He can do intonations, semi-accents, and characterization. I am falling down in delight. And for this writing that is all absolutely necessary. Because Avram Davidson was a brilliant man, with an education seldom seen these days, and a very wry sense of humor/the ridiculous. This was my first Audible download, but it took me over almost two months to finish, in part because the tenor of the stories was all very similiar and the narrator spoke so quickly that the unfamiliar names were difficult to pay attention to, and as the book is filled with unfamiliar sounding names that made the book hard to pay attention to. I'm not sure if the stories were as strange as they seemed because I missed key parts or if there really were leaps of narriative glossed over in the writing. Dr. E. Eszterhazy is a very Sherlock Holmes type character...extremely knowledgable (he holds multiple doctorates) and often called upon to explain the unexplainable. Unlike Holmes, Dr. E. lives in the Triple Monarchy of Scythia-Pannonia-Transbalkania and often encounters *real* magic (rather than the trickery that Holmes encountered). Also, there is a lot of tongue-in-cheek humor written into these stories. The humor is smart and subtle...not many laugh out loud moments, but a fair number of chuckles. This is a collection of short stories---and you might want to take them one at a time. In a continuous run, they begin to blur together. I found Robert Blumenfeld's narration (or perhaps it was Avram Davidson's writing) somewhat soporific. I'm not sure why...it's not like he droned or was boring. I've added this work to my list of things that make me go...Hmmmm??? Right now I can't say I "liked" this book, but I can say, and I am 'thrilled' that I have been introduced to the complex, brilliant, multifaceted mind of Avram Davidson. I am thankful I didn't miss his work/worlds. Experiencing this work would have been utterly unattainable for me without Robert Blumenfeld's dazzling assistance in bringing such vivid life to Davidson's complex "voice" requisite to enter this satirical, humorous, absurdist, real-ish world. Perhaps these "stories" can only be first understood after revisiting and re-inhabiting them a few times. I imagine this work will be especially relevant and more humorous to readers hailing from the British Empire and European cast and title systems. I intend to explore Davidson's more Sci-Fi, other-worldly and hopefully actual storyline oriented books which I imagine will be deeply challenging and thought provoking. Put Blumenfeld on your top narrator list and start somewhere with Avram Davidson. I have read &/or listened to more that 5000 books over the last 40 years. In all that time and with all those opportunities I have not finished only one title - until this book. For only the 2nd time in 40 years I did not finish a book that I had started. Believe me when I declare that I have had the urge to quit several other times, but managed to perservere. However, I just could not justify wasting any more time on a volume that provided no enjoyment or satisfaction. Actually, I did get some satisfaction by stopping the audio player. The producer's hype was terrific. The presenter did a very good job. The subject matter was geared to an intelligent 12 year old and left me cold. I wasted a credit and wish that there was some way to return it to Audible like an inedible meal at a restaurant.